of the place, uncertainty about my surroundings, and excitement at the potential of new discoveries. sensory overload . . . For me, the experience I'm describing is what RV travel is all about." I agree! And you can substitute "running trails" for "driving my RV" and "RV travel" -- it also applies nicely. First, some semantics: "RV" is the acronym for "recreational vehicle." There are photos and a decent description of the various types of RVs at this Wikipedia site. Some people believe RVs are just the types of campers with engines, but I use the broader definition that includes truck campers, pop-up campers, travel trailers, and fifth-wheels (those all require a vehicle to tow them), as well as the self-contained motor homes (Class A, B, and C) -- and all sorts of hybrids. You can also call all of these types of vehicles "campers." To further confuse everyone, each type comes in a variety of lengths and styles. And although all of the larger RVs that you can live in for months or years at a time are mobile, they are not "mobile homes!" Nope. Those are actually stationary residences that were only mobile when transported to their present neighborhood. Just one more example of how confusing the English language can be sometimes! Is RVing Just Another Hobby? Most RVers I meet are enthusiastic about RVing. We come from all walks of life and have one thing in common . . . we love RVing. Some outsiders would classify us as "RV hobbyists" but what they don't know is RVing is a lifestyle and spills over the boundaries of hobby-land. In 1940 Ernie Pyle wrote, "A hobby has a way of running out. You play it for a long time, and then its power to beguile you begins to fade, and finally you have to pretend to play, so as not to be ashamed of the thing to which you once threw your passions." Veteran RVers don't look at their RV and say, "That's my hobby." Rather, they see their RVs as a magic carpet taking them to new destinations, a mother ship providing them opportunities to visit and explore diverse landscapes, a time machine opening a window on the vistas of history. You can't do that staying in the neighborhood, where life demands a more predictable routine. In the RV lifestyle every day is an opportunity to visit a place previously unknown, a chance to witness things yet unseen, to embrace the adventure around the next corner. Along the way you make new friends and create an encyclopedia of memories . . .
Antarctica? North Pole? 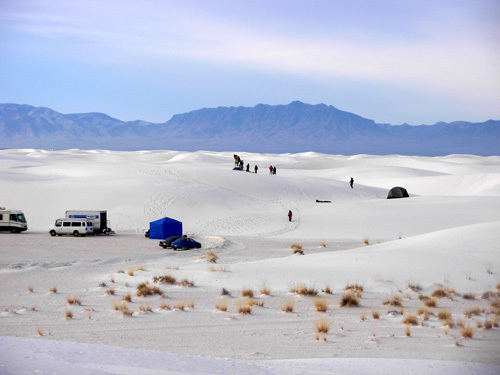 Nope -- it's the White Sands National Monument in New Mexico! That pretty much sums up the appeal of this mobile lifestyle to Jim and me. We use our camper to make mostly extended trips for weeks or months at a time across this vast country to run and work races, enjoy remote trails, observe fabulous scenery, visit friends and relatives, and explore new places in a manner that is enjoyable to us. We couldn't do this, especially with two Labrador retrievers, by car or plane. Nor would we want to, even if we had no dogs. We prefer to stay in quiet, natural surroundings like mountains, woods, or deserts, close to trails, creeks, lakes, wetlands, or beaches. We like the convenience and privacy of our own self-contained "condo" that is mobile and can move on to the next place we decide to wander. To us, that's preferable to the busier, noisier, more crowded motel or resort vacation preferred by many people -- or even going to expensive "private" campgrounds where we have no privacy. Quiet, spacious national forests, BLM land, and local and state parks are our favorite camping venues, and we've also found some very nice military campgrounds. There is a wide range of choices and prices, but to get an RV large enough to live in comfortably for several weeks or months at a time (i.e., with an adequate kitchen, bathroom, bedroom, storage space, etc. ), you'll have to pay more than you would for the least expensive options like a pick-up truck camper top or little pop-up trailer. Those are fine for short trips but too claustrophobic and minimalist for an extended period of time (for most people, at least). So you're talking about spending at least $20,.000 and up to get what you need for a lengthy time on the road, and probably significantly more $$$ than that. It helps considerably to pay cash to avoid interest and/or purchase a previously-owned camper that's already taken its first-year depreciation hit -- same drill as with any new vehicle. In addition, you have to consider the cost of fuel, insurance, licensing, maintenance, campground fees, and other possible expenses like the lovely "personal property tax" hit on big toys that we have to pay in Virginia every year. Most people with a medium to large RV don't chose this means of transport and accommodation to save money. They do it for "lifestyle" reasons. On some shorter trips to races we've driven our Honda Odyssey minivan and slept overnight either inside the vehicle or in a motel room rather than dragging the camper along for only a night or two. It's easier and sometimes cheaper. But for our extended trips of two to five months, taking the truck and camper is by FAR preferable to us than driving our van and staying in hotels/motels/etc. or buying plane tickets, renting a car, and staying in a motel or some such accommodation -- even if the dogs weren't a factor in the equation, and even considering the costs associated with owning and using a camper. Bottom line: for us, it doesn't matter on a long trip if taking the camper is more or less expensive than another mode of travel. We simply prefer the RV lifestyle. It's OUR style. Jim and I have vacationed with campers off and on throughout our adult years, even before we became a couple back in 1999. This is our sixth year traveling all over the country in our current RV, a 32-foot HitchHiker II fifth-wheel camper, shown in the next photo with our tow vehicle, a 2001 Ford F-250 diesel truck. Some fifth-wheel campers are longer than this (up to 38 feet or more). Some are shorter. Ours is a "medium." It's the prefect size inside for us, although we are occasionally limited in where we can park it. For example, it was too big to park at most of the trail heads along the Appalachian Trail when I ran it in 2005. Some state and national park campsites aren't wide enough for slide-outs or long enough for the truck and camper combo, but most parks have a few sites for bigger rigs..
A friend of ours recently sold his fairly new 38-foot fifth-wheel because it was too difficult for him to maneuver in the campgrounds of his favorite venues, Virginia's state parks -- if he could even find a long enough space in which to park. He traded for another camper that's about the size of ours, and is enjoying it so much more. The bigger the camper, the fewer options you have of places to camp. Our HitchHiker has three handy slide-out units ("slides"), which significantly expand the livable space inside when they are open. You can see two of them in the photo above. The third one is on the door side. Jim's had to repair the mechanisms on two of them so far. The most recent time was en route to San Antonio from Carlsbad Caverns a few weeks ago. As with any vehicle, there's always something to fix after you've had it a while. Jim has done a magnificent job of maintaining our camper through the years and of retrofitting it for boon-docking soon after we got it (solar power, generator, etc.). It needs some minor repairs before we take it out again. The main problems are the disappointing quality of materials and construction (despite the research we did on RV manufacturers before we purchased it) and the work it takes to hitch and unhitch every time we move it. That's a big advantage of the self-contained RVs. Sometimes we think it'd be nice to have a medium-sized Class C and pull a fuel-efficient "toad" (tow vehicle) behind it to make our life easier . . . 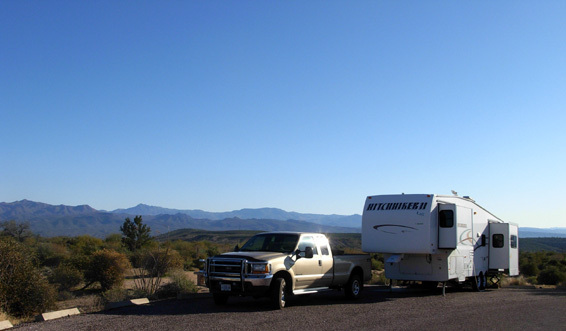 So there we were in Sunbird Central -- southern Arizona in the winter -- and we discovered there were several large and small RV shows scheduled around the state that time of year to tempt said sunbirds into buying spiffy new rigs. Hmmm . . . it wouldn't hurt to LOOK, would it?? We considered driving several hours west of Phoenix to Quartzite, AZ, which is REALLY the Sunbird Capital of Arizona, for a humongous RV show in January. We eventually decided we didn't want to lose our fabulous campsite at McDowell Park or incur the cost of diesel to get to Quartzite and back. So we took just the truck to visit a much smaller RV show on the other side of Phoenix, quite a drive itself "just across town." It was our first serious inquiry into the differences between Class A and Class C motor homes. Class As are the ones that look like buses. The front of Class Cs resemble pick-up trucks and usually have part of the camper extending over the cab, like the one in the photo above from the campground at Ft. Sam. They can be nearly as long as Class As, but most are shorter. We quickly decided a Class C, with either a gas or diesel engine, would be more practical for the boon-docking sites we like to frequent because they are higher off the ground and easier to maneuver on the dirt roads leading to national forest and BLM land -- or anywhere else, for that matter. They would also feel more like driving our pick-up truck than a big 'ole bus. The prices of all of them, however, made our jaws drop! Later I was walking Tater around the campground and the owners made the "mistake" of waving to me when I went by their campsite. Ah, an opening! We had questions. Lots of them. Jim was out running with Cody, so I spent the next half hour talking with the retired couple and getting a tour of the inside, which I didn't expect. (Most RVers are still very friendly and trusting like that.) I returned with lots of information for Jim -- and a big case of RV envy! Some people go to new car dealerships to drool and are never satisfied with what they already own. Others come away with a new appreciation for what they already have, especially if it's paid for, and give up any thoughts of a new vehicle (at least for the time being). We are in the second camp! Even though we could probably buy a suitable Class C for half the cost of the one we loved in the campground, it's still more money than we want to spend on an RV unless we were planning to live in it full time. We have more storage space and room to move around in our (already paid for) 32-foot fifth-wheel than the Dynamax folks in their expensive 34-foot Class C (the length of a Class C includes the cab and engine compartment, not just the living space). I noticed the difference in space when touring the Dynamax, and it surprised me to realize that our camper has much more room inside. We've decided to do some extra work on our camper this spring so we can continue to enjoy it for several more years. But we can still dream, can't we? 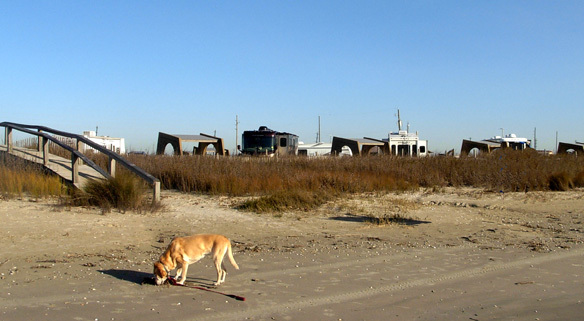 A funny related incident occurred at the Galveston Island State Park campground a few weeks later. A fine-looking Dynamax or look-alike drove by on its way to a nearby site. Deja vu all over again! The younger man and woman in the camper next to us (the couple with the cats on the leashes) were working outside their camper within my range of hearing. He: Wow! One of those would be nice to have! She: Yes, but ours is paid for. Me, cracking up: Jim and I recently had that very same conversation! RV envy is as universal as new-car envy. Since I already included quite a bit about most of the camping venues we used in the daily trip entries while we were in Arizona, New Mexico, and Texas on our recent trip, I'll focus more here on what we liked and didn't like about each of them. I'll include some web links and other information for folks who may use these campgrounds for races or when visiting the same areas. These aren't "campsites" but convenient overnight stops to rest. 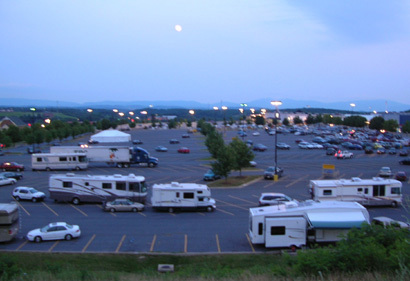 People who "set up camp" in the parking lots only jeopardize the privilege for others, so it's important to avoid looking like you're staying more than overnight (i.e., don't unhitch tow or pulling vehicles, don't leave the camper unattended for hours, don't set up a grill and several lawn chairs, etc.). The obvious advantages are the Big Boxes' locations near freeways and other major arteries, the fact that they are free, and the convenience of picking up groceries and other supplies. The downsides are the noise, bright lights all night, and questionable security in some locations. We always ask someone in the customer service department, preferably the manager on duty, for permission to stay overnight and whether the spot we chose is suitable (e.g., gotta stay out of the way of the trucks that deliver new merchandise during the night). We thank them verbally and by making a purchase in the store. Some locales have ordinances against overnight RV parking at stores like this. I've already done that rant previously. We use these parking lots only in transit, never as a destination, and we're very grateful for the money they save us. These can be one step up from Wal-Mart and Sam's Club if they have a separate overnight lot for RVs away from the noisy semis that come and go at all hours and/or keep their engines running. Flying J, Travel America, and other large truck stops can often be found away from city traffic and noise, although still conveniently located near a freeway interchange. They are free, and fuel, dump stations, propane, bathrooms, and meals are right there, if needed. We have a free Flying J discount card for fuel so that's the truck stop we use most frequently on our trips. 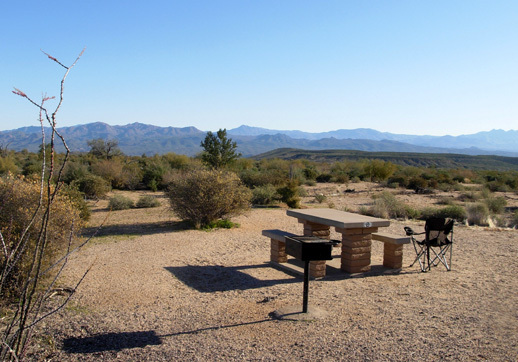 We aren't fans of most privately-owoned campgrounds, although sometimes they are the only option available. We've been to some wonderful ones, like the place we've stayed up to a month in the Bighorn Mountains (Foothills CG in Dayton, WY). They can be cost-effective when we are there long enough to use their lower weekly or monthly rates. We also try to save money by staying at Good Sam Club campgrounds, which offer a 10% discount to club members and must meet certain standards. The private campground we used in Carlsbad (Windmill RV Park) is in the Good Sam network and cost over $31 with the discount. That was fairly inexpensive for the area; most places were higher. We stayed only one night. 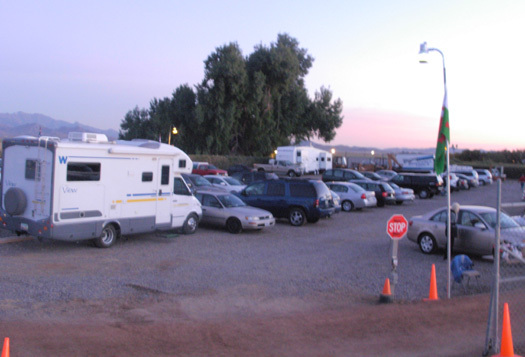 The main problems we have with private campgrounds are the higher comparative cost and the often-crowded conditions. It's wonderful to have full hook-ups sometimes (water, electricity, sewer) and other amenities like laundry rooms and WiFi, but we're often paying for amenities that we don't use, like playgrounds and swimming pools. 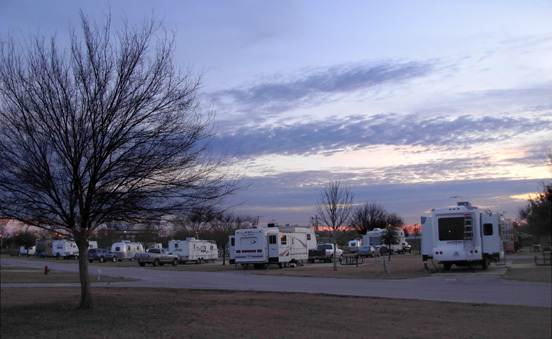 Private campgrounds usually try to maximize their income by putting as many campers into their available acreage as possible. That often means the camper next to us is about ten feet away -- and sometimes less! We like a lot more room for privacy and the dogs than that. I'll expound on this one a bit more, since I didn't say much about it earlier. One of the benefits of being in the Army, Navy, Air Force, Marines, or Coast Guard is the wide network of "Fam Camps," campgrounds that are designed for active and retired members of the military and their families. Relatives can visit their loved ones on base, e.g., and retired military folks can spend all year traveling from one post or base to another around the country and world, if they want. There are hundreds of these campgrounds in all sorts of settings (cities, remote areas, mountains, desert, seashore, etc.) and with a variety of amenities. They are all reasonably priced and reportedly most have very nice camper sites. We've now been to at least five of them and we're impressed. 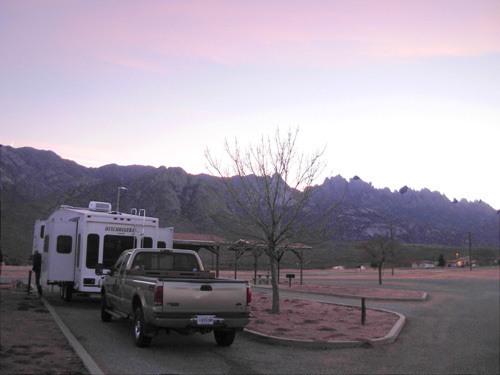 We enjoyed our one night at the WSMR campground. There are only seven campsites. They probably fill up in the spring and fall when the weather is nice (it's very hot here in the high desert in the summer). We made reservations for our night in late January, but we wouldn't have needed to do that because there was only one other camper besides us. We can recommend WSMR for other military families/retirees. It's convenient to Las Cruces, the range museum and missile park, and White Sands National Monument. You can't beat the views looking west toward the nearby Organ Mountains, especially at sunset. The jagged peaks separate Las Cruces from the missile range. I took the photo above from our campsite. WSMR is much cheaper (only $10 with water and electricity) than any of the private campgrounds in the area, and even most military campgrounds. We liked the convenient one-mile crushed stone running trail with exercise stations next to the campground. And it's quiet. Well, except for the music piped throughout the installation at 6 AM (reveille / flags up at sunrise), 5:30 PM (retreat / flags down at sunset), and 10:30 PM (taps / go to sleep, all is well). The latter two fit our personal schedule, but reveille was an eye-opener well before we like to open our eyes! The only complaint we had was the overly-zealous security check-in when we arrived. You can read more about that here. I included more information and photos about this campground in the San Antonio entries, so I'll be brief here. We loved this place! Although it was difficult to find at night, it turned out to be very convenient to shopping in the suburbs and places we wanted to see in the city. There are also a lot of things to do on this very large post itself. The installation is located near downtown but it is so big and the campground so isolated that it doesn't feel like it's in the city. The cost was relatively low ($16/day, $96/week, $320/month) for full hook-ups, large sites with concrete pads and lush grass, trees, laundry room, club house, and nearby trails, golf course, equestrian center, and all the services available on a large military base or post. We highly recommend it, but not when we want to return -- it is very hard to get reservations at this campground in the winter! Sunbirds love it, with good reason. We lucked out and got a spot for a week when someone cancelled a few days before our arrival in San Antonio. Next time we'll make reservations much earlier. We much prefer public(ly owned) campgrounds to private(ly owned) ones -- places on local, state, or national lands. They are usually less expensive and more quiet, secluded, scenic, and spacious. I think the fact that we bought an annual pass to a state park system about six states removed from our own indicates that we rank at least these two Texas state parks pretty highly! We intend to visit them again (or others) before the pass expires. By purchasing an annual pass for $60 on the first day of February, we have a total of thirteen months to enjoy any of the 115+ parks and historic sites in the state without having to pay the daily entry fee, which is charged per person, not vehicle. If we'd gotten the pass on January 31 it would have been valid for only twelve months. The ranger in the office at Huntsville SP clued us in to that little fact! There is also a discount on camping sites, recreational equipment rentals, state park store merchandise, and special programs and events. We've already saved enough ($90) on our recent trip to more than pay for the parks pass and we'll save even more if we go back out there again this coming winter, as we are planning. You can make camping reservations at these two parks. Neither was crowded when we arrived, and neither was completely full on the weekends we were there. In the winter, you may not even need to make reservations but I'd advise it the other seasons. 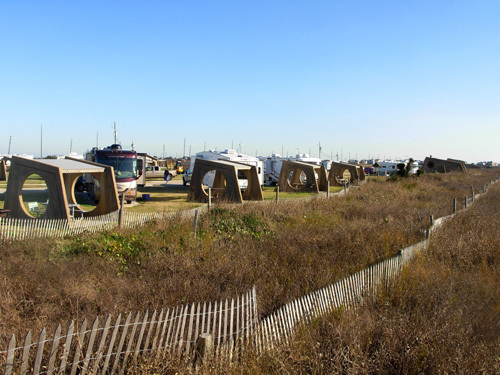 You can find more information and several photos of the campsites at Huntsville and Galveston Island in previous entries in this journal. Check the topics page. This is a great place for runners in the Sunmart and Rocky Raccoon races to stay if they like to camp. The campsites in the Prairie Branch unit are very close to the start/finish area, and sites in the other two units (Raven Hill and Coloneh) are still closer than accommodations in the city of Huntsville. 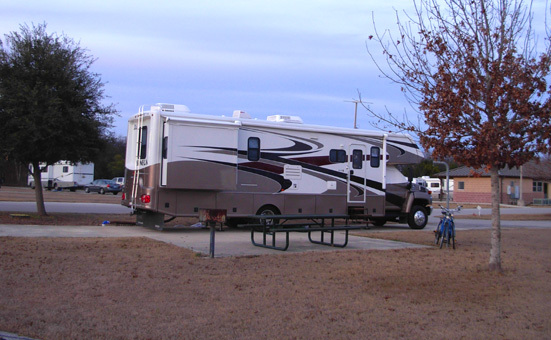 The winter weather is mild enough to camp in tents or recreational vehicles. The entrance fee (without a parks pass) is $4 per person per day. Sites with water are an additional $12 per day or with water and electricity, $16 per day / $96 per week. Screened shelters are $20 per day. There are dump stations (no sewers). All campsites are close to the lake. They are wooded and spacious and have direct connections to the 20-mile trail system. Most of the sites in the Prairie Branch unit where we stayed are geared for small campers. Our 32-foot fifth-wheel is a medium size, and we could fit into only three or four of the sites. We forgot to look at the other two units; there may be more room for larger campers in those. There are lots of activities for every family member, from fishing to birding to boating to alligator teasing (just kidding!!! see this entry) to hiking, biking, running, and horseback riding -- or just plain picnicking and relaxing. Note: bring bug spray and sunscreen even in the winter. This would be a nice place to stay all winter if it wasn't for salt spray eating up your camper. We rarely go to beaches so it was a real treat, especially in February when we were procrastinating our return home to chillier weather. What a beautiful, relaxing place to camp! It's definitely a "destination" campground. We arrived early enough in the week to score a dune site, below, but the interior sites in any of the beach campground units are nice, too. Park entrance fees (without a parks pass) are $5 per person per day. Interior beach sites and overflow bay sites are an additional $20 per day or $400/month; dune sites are $25 a day or $500 a month. Supply and demand keeps the prices higher at this park than most of the others in Texas. All sites have water and electricity. There is one dump station that accommodates two campers at a time. We had about half an hour wait to dump when we left on a Sunday morning, similar to our experience at McDowell Mountain Regional Park near Phoenix when we got behind a group of campers leaving at the very same time. That's unusual for us. 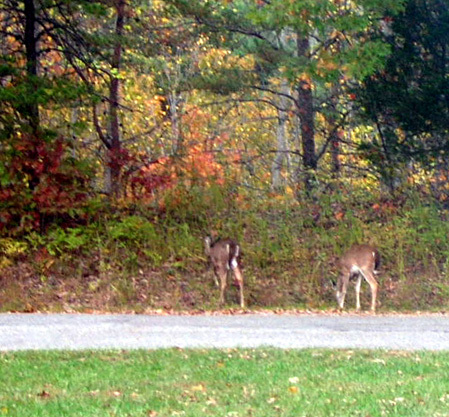 Sites here are flat and fairly spacious -- about 20-25 feet from our neighbors on either side. Most sites are back-ins and are long enough for large rigs. Again, there are lots of things to do in this park and the city of Galveston, which is about seven miles east. There is the beach on the Gulf of Mexico, of course -- about two miles of sand. 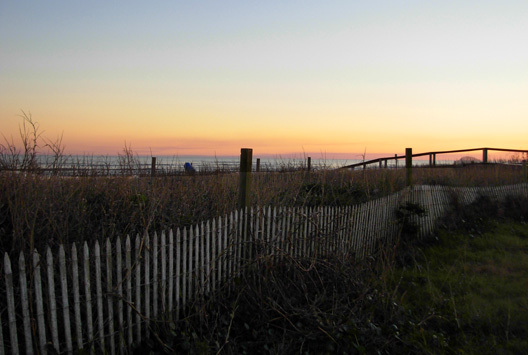 It's good for whatever you want to do at a beach -- walk, run, ride a bike, fish, swim, collect shells, etc. The park has a system of about four miles of trails on the Galveston Bay side, with golden opportunities for bird and other wildlife sightings in the prairie and wetlands ecosystems. Sunrises and sunsets are fantastic anywhere you can get reflections on water. It's a low-key tropical paradise and it was hard to leave! This large regional park east of Phoenix is tied with Galveston Island State Park as my favorite campground on this trip. There's no beach and no bay. In fact, the only body of water I saw was in a muddy stock pond near the ranches on the Pemberton Trail! 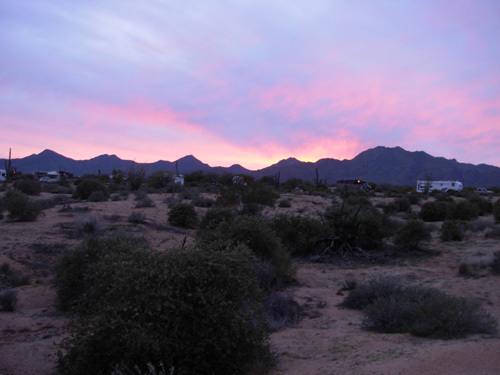 However, McDowell rivaled the beach for the amount of sand it contains, there is lots of wildlife to view (like those intriguing javelinas), the sunsets are gorgeous, and it's a beautiful place to enjoy mild temperatures in the winter. It has some bonus features, too: less rain and fog than Galveston Island; more miles of undulating trails to run or ride; and MOUNTAINS all around it! We love mountains. There is a lot of beauty and silence in the desert in the winter. I wouldn't want to camp there from about April to October because of the extreme heat, but sunny, 60-degree afternoons in December and January are just right. Someday I'd like to be there in the spring to see the cacti and wildflowers blooming. This campground is perfect for the ultras that are run in the park: Javelina Jundred in late fall and Pemberton 50K in February. It's also a nice place to hang out before or after any other race in the Phoenix metro area, like Across the Years. (It's almost a two-hour drive to ATY, so we wouldn't stay there during that race. Other units in the Maricopa County regional parks system are closer to Nardini Manor.) 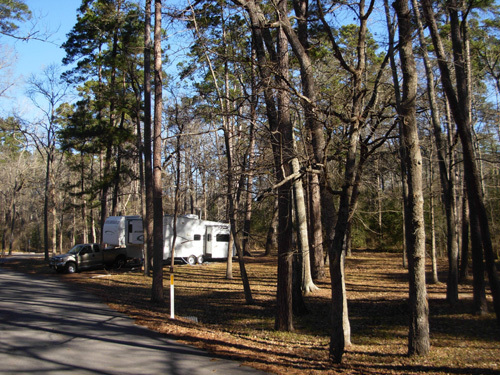 There are day-use entrance fees to the parks, but they are NOT charged in addition to the campground fees like they are in the Texas state park system. The 76 campsites in the family campground with water and electricity are $18 a night, making it cheaper to stay here than either of the two Texas state parks we used (even with our parks pass). The sites are first-come, first-served -- no reservations here. We had no problems getting a prime spot by arriving early in the week. The choices are more limited if you arrive on Friday or Saturday. The maximum stay is supposed to be fourteen days, but you can extend that if the sites aren't all taken when you plunk more money down. We were there eighteen or nineteen days. The only time it filled up completely was our last weekend when there was a big bike race in the park. There are two overflow areas without water and electricity for additional campers when the family campground is full. There are also three group campgrounds; they can be reserved. Most of the sites are really large, with lots of desert between each one. We were at least a hundred feet from campers on either side of us, and forty feet when someone parked across the road from us on bike race weekend. We chose a site (shown above) on the outside of our loop in order to have unobstructed views and more privacy. The campground is directly linked to the extensive trail system (over 50 miles) in several places. I could stay here all winter if I was allowed! These are our favorite camping sites, but we didn't find any on this particular trip. One of the many reasons we love our trips to Colorado so much are the fabulously scenic, FREE boon-docking sites we've found in that state. The next time we go to the Southwest we'll do more research ahead of time to see if there are suitable national forest locations besides Quartzite, AZ where we can camp. Most of these spots in Arizona and New Mexico appear to be farther north or at higher elevations that are under snow in January and February. That defeats our heat-seeking reason for going there in the first place! All things considered, Nardini Manor had to be the BEST place we camped during our Southwestern trip! Thank you, Rodger. Flying Js are usually our best option for refueling the truck-camper combo at accessible diesel pumps and for dumping gray and black water; they also usually have the cheapest fuel, especially when we use their discount card. (It's not a credit card.) The card is free and gets us about 3 cents off per gallon. Every little bit helps. On every trip I've kept records of where we got diesel, how much we paid, how accessible the station and the pumps were, and other relevant information -- and then I try to remember to take those notes with us the next time we head the same way! They are the most useful on out-and-back trips. I keep all sorts of other information, too, like locations of stores we might want to use (Cabella's, REI, Costco, etc. ), interesting landmarks for "the next trip," campgrounds that look nice, and other things that catch our attention. When we're traveling, it's hard to come home. When we're home, we love our secluded little piece of paradise but we dream of being out on the road again. Well, not the driving part of it, but the great destinations we find. Sometimes we regret not full-timing in the camper for a longer period of time than five months when Jim retired in 2004, after we sold our house in Montana and before we bought the one we have in Virginia. In retrospect, perhaps we should have waited to buy another house so soon and spent more time exploring the country while most of our possessions were in storage. At the time, however, we really wanted "roots," a "place to come home to." We loved the Roanoke area as soon as we visited the first time, and both the locale and house met more of our criteria than any other part of the country we had researched for several years. For now, we figure we have the "best of both worlds." We love our home and community too much to give them up permanently. Traveling for several months of the year satisfies our urge to explore and grow. Full-timing in an RV is not out of the question again for us at some point in our lives, however -- the rambling RV lifestyle is very appealing. It may be appropriate when we can no longer keep up with maintenance on our house and yard and need to sell the place. We'll just ride off into the sunset in our camper! Next entry: Southwestern cuisine -- ol�!